Is the SP Walking Brace right for me? Ideal for those with forefoot or midfoot injury, acute pain, foot fracture or post-surgery. Try our Brace Advisor for personalized product recommendations to meet your needs! The SP Walker provides semi-pneumatic support with Aircast semi rigid shell protection and is available in 5 sizes (pediatric, small, medium, large and x-large). Foam-filled aircells cushion the ankle for customized comfort and support. This support is effective in fracture healing, managing edema, and post-op protection. Do not over-inflate aircells. Improper aircell inflation may cause significant skin irritation in patients with diabetic neuropathy. Reduce aircell compression with any visual skin changes or reported discomfort. Do not use this device on patients incapable of communicating physical discomfort. Like all lower extremity immobilizers, such as casts or braces, patients without sensation (i.e. post-op anesthesia, neuropathies, etc.) should be monitored frequently for "hot spots," skin irritation or wound management. Use caution when walking on slippery or wet surfaces to avoid injury. Shop our complete selection of walking braces or browse additional Aircast products. Is the foam washer liner washable? Mine needs to be cleaned but I can't find information on caring. If so, cold or hot water? Air-dry or dryer? Yes you can wash the liner. Make sure you hand wash in lukewarm water, mild soap and air dry. I have an avulsion fracture of the 1st phalanx. I wear a true size 8 women's shoe. Both the small and medium have an 8 size range. Would it be better to go smaller or bigger? Thank you! I have a pinky toe fracture and was wondering if the sp short walking brace be suitable for me? I basically need it to stabilize my foot. I would love to get rid of my crutches and use the boot to walk. In am petite, 5' 96 lbs, however, I wear a size 8 or 7 1/2 shoe. I have a stress fracture in my foot. The doctor gave me a "boot" to wear. It is very uncomfortable and heavy. What size should I order for the Air Cast SP Walking brace? Thank you for your assistance. What is the weight of this product? Does it matter if it is left or right foot? How much EXACTLY does the medium size weigh? I am currently using a Maxtrax that weighs 2.5 lbs. it is heavy to walk in. My doctor placed me in an Aircast walking brace for soft tissue injury, arthritis, swelling, and inflammation of the foot. Prior to my injury I had been walking 3-4 times a week for an hour but stopped due to injury. Can I return to walking with the boot for the next 6 weeks? What is your recommendation? to use. Its an old boot I have and the doctor told me to wear it for three wks. but the pain is the same as no boot at all. Hi I have a medium Aircast walking brace. I am trying to find a shoe that matches the rise of this boot so I don't have so much imbalance when I walk. Can you tell me the rise and the drop of this boot? Answer urgently needed! My daughter (16) is wearing an Aircast SP (low model) for sesamoiditis and her doctor has recommended padding it beneath her heel and around her ankle and low calf area, because wearing the cast is causing her additional pain. She wears a 6 1/2 shoe and was given the size small--she is a ballet dancer and has very narrow heels, tiny ankles and small calves. Would the pediatric boot be better, and/or what materials do you recommend for padding beneath the heel? They recommended rolled-up washcloths on the sides of her leg. If she tightens the boot around her ankle or adds more air, this causes numbness. Hey ,in case of buy the item and want to return it is it ok with that or what?? How much does the Aircast SP walking brace size Medium weigh? Do these walking boots have a slip-resistant sole? What is the difference between the FP and the SP air cast? I am very mobile at work, I'm looking for a cast that is curved at the bottom for easy walking, but also takes maximum pressure off the front of my foot. I've had a drop foot (lower leg paralysis, severed sciatic nerve, hit-and-run driver) for 40 years and the ankle joint is very unstable. Any lateral movement or pronation or supination is painful. I've run the gamut of AFO's and nothing really works. I'm very athletic, including competitive rowing, and wish to keep at it. Rowing requires driving off your feet. Would the SP be suitable? Also how do I submit my MD's scrip for Medicare? Can't get through on your '800' number. I ruptured my achilles tendon and have had surgery. I'm in the second phase of a cast with my next phase being a walking boot. Could you recommend a walking boot that I would need? I want to show my doctor and see if they will allow me to use. I'm a size 9 shoe and wonder what size I would need. My leg has atrophied some since my surgery. Thank you. I was considering this support but was concerned about calf size. Shoe size I am looking at needing a Medium but was concerned as I have a large diameter calf. 17"
The pnuematic air cells allow for a customized fit and can accommodate a larger calf size. Does this cast work for Charcot foot? Thank you for your question you can use the Aircast SP Walking Boot for Charcot foot. I sprained and tore ligaments in my big toe. I cant put weight on it and its been about 2 weeks since the injury. Ive been walking on the side of my foot. My question is, would it help me if i got this? How is the traction on the soles of these walking casts? Good enough to be safe when walking on snow/ice? Doctor told me I have a bruised bone on my outer ankle. He recommended the Aircast boot. When I apply the pressure with the air it hurts bad and I can't lift the boot. Am I doing something wrong? Should I put more air in until it doesn't hurt? Thanks in advance. Is this boot suitable for being in an MRI environment with their heavy magnetic field? is it good for badly sprained ankles? For badly sprained ankles the Aircast FP Walker would be best. It will immobilize your ankle and allow you to walk without as much pain. I wear a womans 6 what size should I get? I feel and sprained my foot and ankle..my ligaments and tendons have been strained ..I was wondering if this boot would be helpful ? If you sprained your ankle as well as your foot the Aircast FP Walker would be the best choice for you.https://www.betterbraces.com/aircast-fp-walking-brace For ankle injuries the immobilization needs to extend beyond the lower calf. My son is a 11 and a size 5.5 shoe. What size do I get for his walking cast? Also, I need quickly. If I order on Monday can I receive by Weds? Finally, he needs one for each foot. Are there left and right foot air casts or are they one and the same? I just started 2 days ago to wear the brace and I am so sore on either side of my calf. I have tried adjusting the air, wearing a higher sock but to no avail I am rubbed raw. Good thing is my foot feels better when I wear it. 5th metatarsal stress fracture. I stand 10 hours a day so maybe this "walking" cast is not for prolong hours. Please help. I have been diagnosed with an ankle stress fracture and prescribed the aircasst boot. Dr also recommended the use of Fragmin, to avoid deep vein thrombosis. I am 55 . Is this normal? I have no history of thrombosis at all. I unfortunatly can only answer any questions related to you aircast SP walking boot which is indicated for your ankle and foot injuries. If you need something with alittle more support we also have the Aircast FP walking boot which is a little taller. If you have any questions about medication that you have been prescribed you should talk to your physician. If you have anymore product related questions please don't hesitate to contact me. thank you for contacting Product Support. Confidentiality Notice: This message, together with any attachments, is intended only for the use of the individual or entity to which it is addressed and may contain confidential or privileged information. If you think you have received this message in error, please advise the sender and then delete this message and any attachments immediately. I used to wear a size 6,8 then a 7. Now I wear an 8. Should I buy a small or medium? I would order a Medium if you are a solid 8. if you are a smaller 8 and sometimes 7.5 i would go small. Hi. I have severe heel pain and I have tried everything from different foot beds to heel cups to braces, would the air cast SP walking brace help me? I am on a big vacation that involves a lot of walking! Please let me know ASAP! Yes, the Aircast Walking Boot will take the pressure off of your foot. They are recommended for stable fractures, ankle/foot sprains. Will the air cast help a broken foot? I believe this question was asked and answered already. The Aircast Walkers are worn post injury and is designed to immobilize the foot during healing. I'm a little unclear what you mean by "help a broken foot". If you have further questions, please feel to contact our product specialists at 888-405-3251. When someone suffers from a broken foot, this walker is indeed one that is recommended. I'm a little unclear what you mean about it "helping", but people do wear this brace post-injury to keep the foot immobilized during their healing phase. If you have further questions, please feel free to contact our product specialists at 888-405-3251. I have a really big calf muscle/leg would this boot fit and be comfortable? I have been given an aircast for a fractured toe. (from the podiatrist) Can you please tell me the height of the heel. I have hip and neck issues and need to find a shoe / sneaker that will be easy to walk in with the boot. I currently had on Asic running sneakers and these were too low according to the doctor. Looking for some safe options. My Son has to use the Air Boot for awhile. I know it can get wet, but is it submersible? 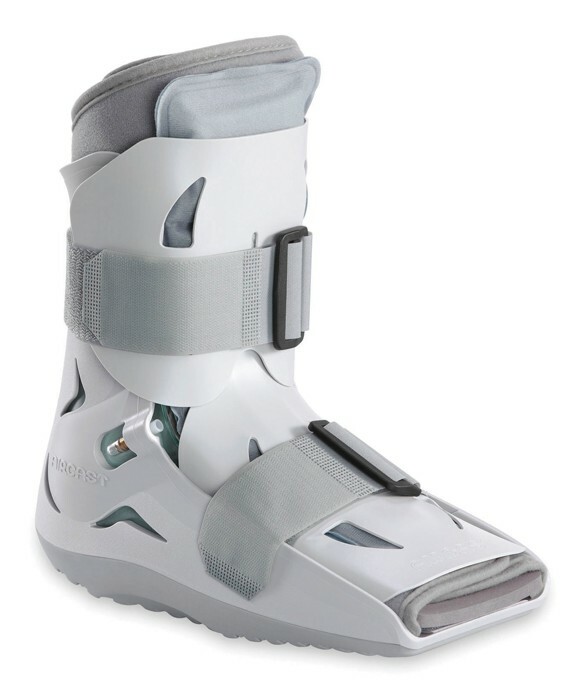 This may be a dumb question; my doctor just put me in this boot yesterday; I have a lisfranc injury. When I wear slacks, should I tuck the pant leg into the boot or let it sit on top of the boot? Tuck them inside the boot unless you can fit them normally over the boot. I wear a women's shoe size 11 and my feet are narrow to medium. What size should I get in the brace? I had to start wearing the Aircast SP walking brace today because of an injury on my left foot. I’m wondering what I’m supposed to do when it rains or snows. Can I still wear the boot outside in that type of weather? If so, how do I protect my foot from getting wet because I can only wear a sock while wearing the aircast? We do make a weather cover for rain and snow. It can be used with any of our boots. What is the weight of the Aircast SP Walking Brace? is it better to wear a sock with the cast or not? We suggest wearing a sock while using the Aircast SP Walker Brace. Where can I find replacement liners for the SP Walking Brace? Mine has started falling apart after only 3 weeks. I was recently diagnosed with Plantar facitis which I have had for almost 2 years but did not have checked until last week. It was recommended I wear a walking boot ( aircast) for 6 weeks. Does this cast work for PF? depending on how sever a doctor will try to immoblize the foot, the Aircast SP walker is a great option for this. I will be asked to wear boots after my Achilles surgery for bone spurs removal. Are there any distinct advantages of using AirCast SP over FP model? The SP walker is for foot fractures and injuries the FP walker is better for ankle and lower leg injuries so I'd reccomend that for you. Does this walker come with the AirCast sock liner, as indicated on the accessories page? No those do not come with a sock. Only the XP and FP walkers come with socks. The air cushion does not stay inflated. Are there replacement air cushions for the ankle? Yes the aircells are replaceable. Please call to place your order. 800-553-6019. Is the hand bulb available seperately? I have lost mine. Yes, it is on the betterbraces website. What are the care instructions for this boot? is the liner machine wash and dry? The SP Walker Liner is Hand wash, Lite detergent, and air dry. Is the liner machine washable? Yes, the inner liner is washable. You want to wash the liner by hand and air dry. Please pay close attention as you take the liner out so that you will know how to put the liner back in. Many times people forget how it went in the boot and cannot put it back in. My orthopedic Dr. put me in the Aircast SP walker for a broken ankle. Do I need to wear it in bed too? It's not comfortable for sleeping! Unfortunately I can not answer that question for you. That has to be your doctor who makes that decision. I can tell you that most doctors do want their patients with broken ankles to wear the walker at all times. If your doctor does tell you that you have to wear it in bed, I recommend sleeping on your back and propping pillows on the side of the boot so that it is supported. I hopet his helps. Can these be worn on either foot or are they L/R specific? The Aircast SP Walking Brace is not L/R specific. It can be used on either foot. I would like to know if you have nothing but mdicaid would they pay for you to get this brace when you just don't have the money to purchs one. You would need to contact medicad directly to get the answer to that question. The Aircast SP walking brace is for Metatarsal fractures. The brace is short, cause it is specifically for foot injuries. With the aircell design, it helps taking of some of the pressure and weight on the injured areas to allow them to heal, while still trying to be somewhat functional in your day to day activities. Can this brace be used for a stress fractured calcaneus (heel)? Yes the AirCast SP Walker can be used for Calcaneus Stress Fractures. Can you do lower body weight training in these braces? Thank you for taking the time to email us here at www.betterbraces.com regarding our AirCast SP Walking Brace and doing weight training in it. First of all, this is a question for your doctor, therapist, or athletic trainer who's overseeing your rehabilitation protocol. Functionally, the boot would hold up but you should ask your clinician if you are supposed to be doing specific weight training or rehabilitation exercises with the injury or diagnosis you have. If you have any additional questions please do not hesistate to contact us again. Is the tool for inflating the boots included? Can you order the hand bulb for this model? Does this keep your toes from moving? The SP walker is designed to immobilize the foot and ankle, including your toes. A walking boot like the Aircast SP walker is designed to completely immobilize the foot and ankle area. Be sure to inflate the aircells to reduce gapping. Will this walking brace help a sprained ankle? Treatment of a sprained ankle is typically immobilization of the ankle to give it time to heal. The Aircast SP Walking Brace will provide that immobilization to the entire foot and ankle area. Do you have any braces that work for foot drop due to stroke? The Aircast SP Walking Brace will address the foot drop by keeping the foot at a 90 degree angle from the leg. Your doctor will advise how long to wear the walking brace depending on your injury level. can I drive with a walking fp air brace? We do not recommend driving with the boot on. This is extremely hazardous and can cause an accident. Can you order just the liner for this model? Can the foam insert be washed and can you buy replacement inserts? Does the Aircast SP Walking Brace COME with the air pump or what do you use to get the air in? Yes. The brace comes with the Inflation Hand Bulb. We recommend wearing either the Aircast FP or XP Walker for this type injury. The Aircast SP Walker is ideally suited for foot fractures/injuries. The XP or FP Walker's will provide more support and stability for you. Does the same SP Walker fit both left and right foot? Yes, The Aircast SP Walker fits either foot. I got this several months ago after developing plantar fasciitis. I love this walking brace and use it at work daily. I walk more then three miles at work as a security guard and am able to use this on stairs. I highly recommend this and I love that I had the option to get this instead of using crutches. My foot feels wonderful in it and I feel no foot pain. I just found this website and love the fact that they sell replacement parts as I'm about to buy right now. :) I also love that I do not find it heavy and that my foot does not move around in it due to the air pockets that you can inflate. I was worried my pant leg would not fit over it and they wouldn't allow me to wear it at work but my jeans and work slacks do fit over it perfectly with no problems. Only down fall will be when it rains and when winter comes, summer time its perfect and my foot does not sweat in it for as much walking as I do. I have larger calves and have no problem with it fitting. I found out the tighter it is the better your foot feels and doesn't move. Also your foot is protected by the top part of the boot which is hard because you will hit things with it. After awhile you won't even realize that you have it on. Hope you find it as wonderful as I do. Just received this but immediately realize there is no support for my arch so will have to adapt with purchased arch support and see how it feels then. Having suffered from Plantar Fasciitis for years, I needed a new air cast. My foot takes forever to heal because I work on my feet. I wear the air cast during the day and my splint every night, and I am slowly improving. Wearing the air cast takes away that awful PF pain that I have with regular shoes. Thanks for a great product! Cons: Can't think of any! Much better than the long soft one made by DJO. I could not walk in it because it cut off my knee. This one provides more support with rigid support on all 4 sides & allows more natural walking with rocking & it being only 1/2 way up my leg. Wish the doctor had recommended this one instead of other which cost 4 times more. So sorry I did not find you sooner. Wow! Wish I had known about your site! I injured my left foot a short while ago. The doctor called it a sprain, but said a chunk of bone was pulled off when the ligament pulled away from my midfoot. I thought this was an avulsion fracture, but hey, I never saw the xray. Anyway, I wish I had known about this site sooner! The charge for the brace from the doctor's office was almost $400, and with my insurance, I ended up paying about$100 out of pocket for the brace alone. The only difference between the one from there and the one on your site is that the doctor's office had their name put on the strap over the foot. I would have rather not have paid to have the "privilege" of advertising for them. The brace has been great. I started with 2 crutches for the first couple of days, and went to just one., which has merely been used for when I'm tired for the last few days. It can be a little awkward, but it is so much better than a stinky cast that won't let you scratch an itch. I wear Merrell Jungle Mocs most of the time, so the heights are about the same so I'm not walking like a penguin. I expect to be allowed to graduate to no more boot within the week, but I am quite happy with how easy it has been to get around. I will keep your site in mind in case I ever need another brace for anything else! I recently broke bones in both of feet, and the Ortho DR sent me home with two of these walker braces.. Couldn't be happier, put these on and I am walking everywhere. Love that you inflate them to the comfort level that you need. Feel a little heavy, but my feet do not move around in them, and are great that you can take them off to get a shower and not have to sleep in a hard cast. Everyone says they look like ski boots, oh I wish, but I think that I will heal much faster wearing these instead of a hard cast. After slipping on the ice at work, I sustained some pretty sore tendons and ligaments in my foot. I was offered this boot and a post-op shoe. Previous experience with heel surgeries told me to go with the AirCast. Great decision! Now I can go back to work with minimal pain! I thought that this aircast would be easier to move in, it is bulky and heavier than the fibre glass one I had. I kinda wish I would have left the fibre glass one on just because it was easier to move in. I wish I had better reviews. I couldn't wait until I received a walking cast. This gave me a sense of freedom and safety. I liked the inflation on each side to customize the fit as the swelling ceased. It wasn't incredible heavy either and didn't take long to get the hang of walking in it. Hi, I was watching the video and readings my comments which made me decide to buy an aircast. I've had heel/foot/ankle issues for over a year when I sprained it in march of 2012. Thank you!! !